Fascinating fact: 100% of 1965 Rover-BRM Le Mans car owners also own Sterlings. I also came across this ad just minutes before I would have forgotten forever that either of these vehicles existed. 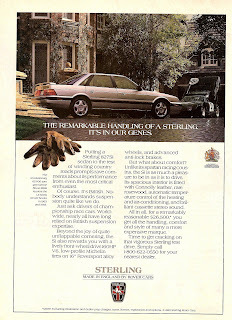 The appeal of owning a Sterling is somewhat muted due to the fact that they aren't really British cars. Sure, they were sold in England as the Rover 800, they have all the requisite rich leather and burl, and some minor suspension changes were made because the Japanese just "didn't understand". But in the end, its an Acura underneath - for better or worse.